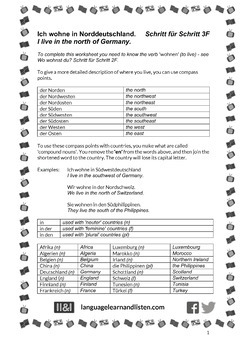 This worksheet requires knowledge of the verb 'wohnen' (to live).In this worksheet you will learn how to make 'compound nouns' with the compass points, along with a variety of countries, to say where you live. There are 2 exercises (German to English and English to German) and all vocabulary (other than the verb) is provided. Suitable for all levels of ability. Answers provided.